The street performer known as Reverend Billy wants the New York Police Department to respect his constitutional free speech rights. 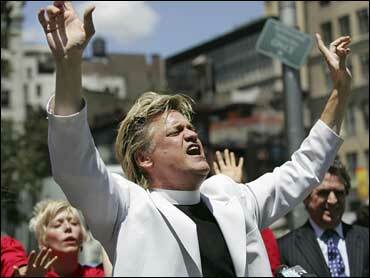 Reverend Billy — a cross between a street-corner preacher and an Elvis impersonator (except that he is blond) — was arrested on harassment charges last week while reciting the First Amendment of the U.S. Constitution through a megaphone in Manhattan's Union Square. On Monday, he donned his trademark white suit and returned to the scene of his alleged sin to demand that police repent. "It feels so good to be back on the very spot where I was denied my First Amendment rights by reciting the First Amendment," he told reporters over the din of an NYPD helicopter hovering overhead. Reverend Billy, whose real name is Bill Talen, was joined by women in red choir robes who sang a hymn version of the amendment that guarantees freedom of speech and other basic rights. Other activists distributed an amateur videotape of his arrest. Talen, 57, has spent years using his mock persona as a fire-and-brimstone evangelist to rail against the consumer culture — what he portrays as the Disneyfication of Manhattan. Earlier this year, he was arrested on misdemeanor trespassing charges for protesting at a Starbucks; that case is pending. His latest run-in with the law began after he turned up to support people gathering in Union Square last Friday for the monthly Critical Mass bike ride asserting cyclists' rights. The NYPD has aggressively policed the rides, arguing that they have the potential to interfere with traffic flow and threaten public safety. Advocates for Critical Mass have accused police of infringing on the riders' constitutional rights to free speech and free assembly. The video from Friday shows Talen preaching the "44 beautiful words of the First Amendment" to a visibly annoyed congregation of police commanders huddled a few feet away. At one point, an officer approaches and warns him that his sermon is breaking the law. "What's the law?" Talen asks. When Talen persists, another officer comes up behind him and slaps on handcuffs. While being put in a police van, the satirist shouts, "We have a right to peaceful assembly!" Talen was held overnight before being released without bail. A criminal complaint alleges he harassed police officers by approaching them and "repeatedly shouting at such officers through a non-electric bullhorn." Civil rights attorney Norman Siegel, appearing with Talen on Monday, called on prosecutors to drop the charges. "The arrest was a false arrest," Siegel said. "What Reverend Billy did last Friday night does not constitute illegal conduct."